Use garden container size appropriate in scale and proportion to the dimensions and the mood of your landscape and the size, shape, and cultivation needs of your plants. Containers are available in a multitude of sizes, both as utilitarian options, (usually plastic or wood) and decorative options. From a design perspective, two considerations are important as you consider the size of your container choices. The first is practical in nature. Your container must be large enough to meet the horticultural needs of the plants you intend to add to your landscape. The needs of your chosen plants may vary considerably, depending upon their eventual size and the longevity of their life spans. Containers for large and deep rooted plant selections should be chosen to accommodate eventual size or you will need to plan on repotting plants as they grow larger. 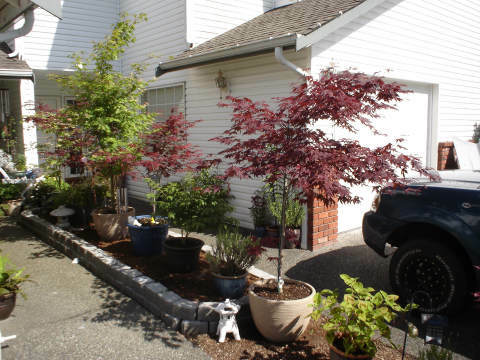 Trees, shrubs, and deeper rooted perennials should be treated to larger containers. 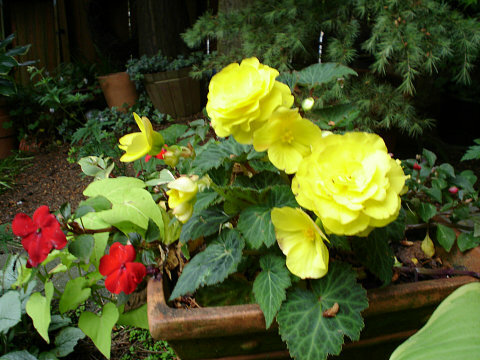 These plants need to inhabit their containers for longer periods and are bulky and heavy to move. 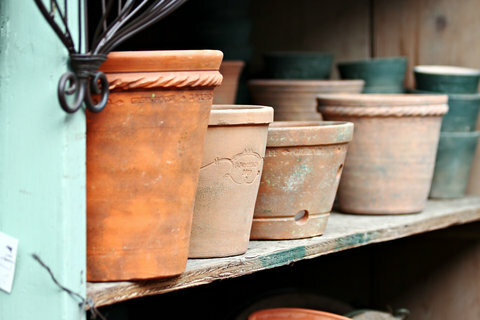 While no plant truly thrives in containers forever, these large plants will likely remain in their selected containers for several years, so plan pot capacity accordingly. Smaller, more shallowly rooted plants, whether annual or perennial in nature, are much more adaptable to tighter quarters with the proper care. These containers are more likely to be renewed regularly, thus allowing more freedom in the choice of container sizes. In any case, garden container size must be sufficient to maintain plant health for the full expected lifetime of the plants chosen. Most plants do live longer in larger containers. The larger the container for your plants the better, from a cultivation standpoint. Especially plants such as trees, shrubs or large perennials will be much happier for longer periods if they are not asked to struggle with quarters that are too close for comfort. The second consideration when evaluating garden container size is design potential. From a design perspective, this is when things get most exciting. The options are nearly endless, between materials, colors, styles and shapes. But the first consideration, at least in my opinion, should always be the container size. Container size is a keystone to how your new container design will suit your overall garden space. Four basic guiding principles should inform your decision. Balance garden container size against the characteristics of the plants you expect to use with them. 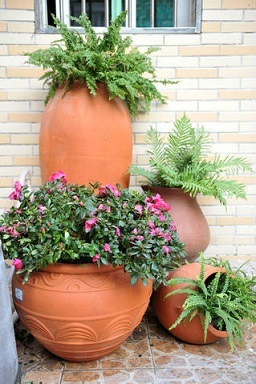 Large leaved, coarse textured plants demand larger, often taller pots while small, dainty plants can easily be housed in teacup sized containers. 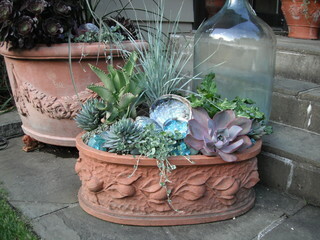 Use spectacular pots for single plantings. Stellar plant combinations can withstand less exotic pots. Balance garden container size against the dimensions of the garden areas in which your container display will be employed. Oversize containers are often excellent in diminutive garden spaces as they provide strong points of interest and draw the eye. Smaller garden containers are often best used in smaller beds or on patios, on shelves or benches. The area in a landscape where a garden container will be placed is a part of the context for the overall composition. Use adjoining objects to heighten drama. Pay attention to the range of sizes that you combine in container gardens. Developing strong contrasts between smaller and larger containers creates interest within the overall composition. Combinations can range from tall to short, wide to diminutive, or even a series of stepped sizes which lead the eye to a final focal point. shape, size, color and style can capture attention. Be creative in thinking about how you will select new garden containers that will add dimension to the garden. Dramatically scaled containers demand attention. Whether the surrounding spaces are small or large, these unusually sized containers achieve the perceived status of fine art in most situations. 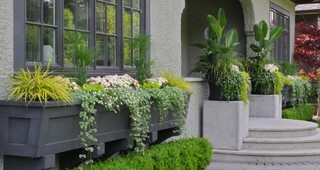 Smaller gardens especially benefit from large, dramatically scaled containers. 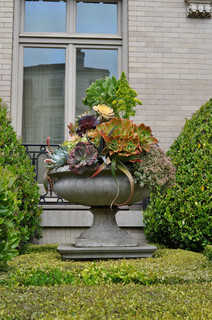 Used in these situations, large sculptural containers add sophistication and drama to the garden that would likely be difficult to achieve in these smaller spaces. Dramatic oversized containers also work extremely well to define transitions from one garden space to another when paired. At the entrances to paths, stairs, or the house, these containers fulfill a starring role. Garden container size can be an excellent tool to lower maintenance in your garden, but its more significant and overlooked role is that it can be an outstanding tool to change the look and feel of your garden. Oversized or diminutive, containers help to transform space and create mood. Keep in mind container size as an aid to create the look and feel you want in your garden.